Small volumes of anti-TIMP3 antibody vial(s) may occasionally become entrapped in the seal of the product vial during shipment and storage. If necessary, briefly centrifuge the vial on a tabletop centrifuge to dislodge any liquid in the container`s cap. Certain products may require to ship with dry ice and additional dry ice fee may apply. esultant inhibition of proteinase function (1,2). In addition to MMP inhibition, TIMPs have also been shown to interact with various membrane receptors on the cell surface. Some of these interactions include: TIMP1 with CD63, TIMP2 with alpha3beta1 integrin, and TIMP3 with VEGFR2, all of which result in distinct cellular effects (3). TIMPs are involved in a wide variety of biological functions, such as tumor angiogenesis and progression (4,5), wound healing, and vascular remodeling (6,7). Mutations in TIMP3 are associated with Sorsby's fundus dystrophy (8,9). Western blot analysis of extracts of various cell lines, using TIMP3 antibody at 1:1000 dilution. 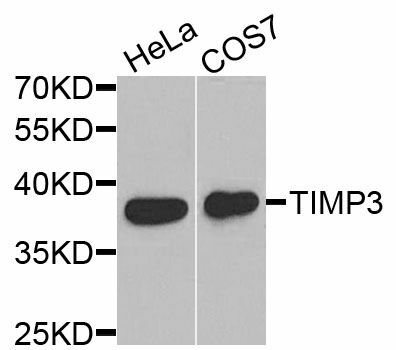 Immunofluorescence analysis of MCF-7 cells using TIMP3 antibody. Blue: DAPI for nuclear staining. NCBI/Uniprot data below describe general gene information for TIMP3. It may not necessarily be applicable to this product. TIMP3: Complexes with metalloproteinases (such as collagenases) and irreversibly inactivates them by binding to their catalytic zinc cofactor. May form part of a tissue-specific acute response to remodeling stimuli. Known to act on MMP-1, MMP-2, MMP-3, MMP-7, MMP-9, MMP-13, MMP-14 and MMP-15. Interacts with EFEMP1. Belongs to the protease inhibitor I35 (TIMP) family. 1. Data show that gene polymorphisms of TIMP metallopeptidase inhibitors TIMP-3 -1296 T>C (rs9619311) and TIMP-4 -55 T>C (rs3755724) were associated with the susceptibility of hepatocellular carcinoma among Taiwan women.